The minister decided to do something a little different one Sunday morning. He said ‘Today, I am going to say a single word and you are going to help me preach.’ Whatever single word I say, I want you to sing whatever hymn that comes to your mind. Memories can be precious, but to live our life in the past is not practical, nor pleasing to God. It means you have stagnated, been put out to pasture, basically your life is over. Life is meant to be lived in the now, with new precious memories. God is God of the Living, God is actively, intimately involved in your lives. He wants to be your God of the Now, not the God of the past. God asks the question each and every day you get up: What are you going to do with me today? We recently looked at how God values the Blood of Jesus Christ. He values the Blood so supremely that it was sufficient to satisfy His righteous demands for sinful man, it is powerful enough to enable us to be declared righteous, it is powerful enough to allow God to dwell in us, it is powerful enough for that very same blood to cleanse our conscience, not only at Salvation, but each and every day we live. It is powerful enough to put God on the side of man against all the accusations of Satan., In fact, through the blood, God declares that there is now NO CONDEMNATION. Satan can’t bring one charge against us. The difficulty you and I face is one of belief. This week we will look at FAITH, and what it means to live a life of faith as Paul presented it here in Romans 3:26-4:24. 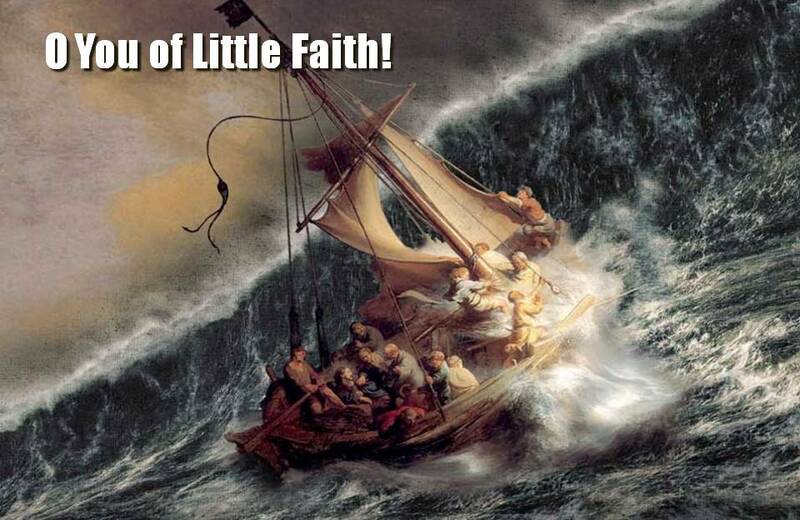 The saddest indictment that Jesus can bring against you is “O you of little faith! Faith represents a storm of change. Instead of being tossed about by the storms of this world, you are in charge, you are in control. Your storm is more overpowering! FAITH has that power. It is not your personal power, but it is a rock solid belief in the one who has the Power! 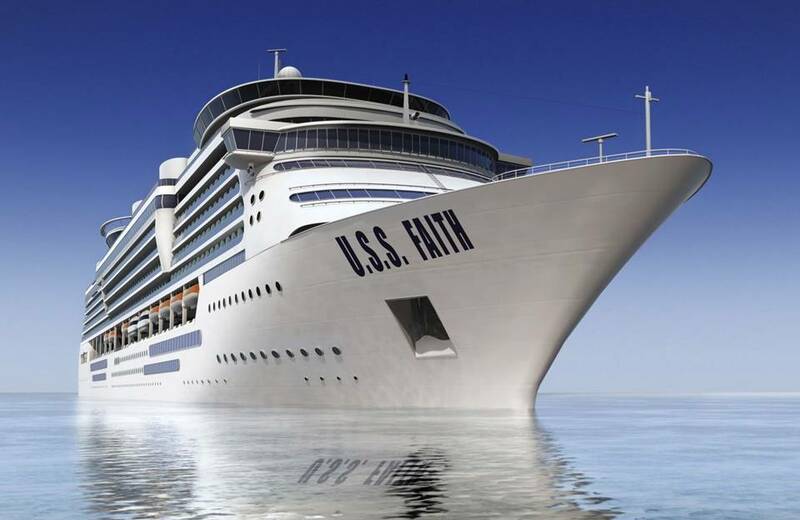 So this morning I want us to step inside the Ship that Jesus commands, it is the ship called the USS FAITH! Let’s see what we need to learn in order to weather any storm, any tsunami, any hurricane! 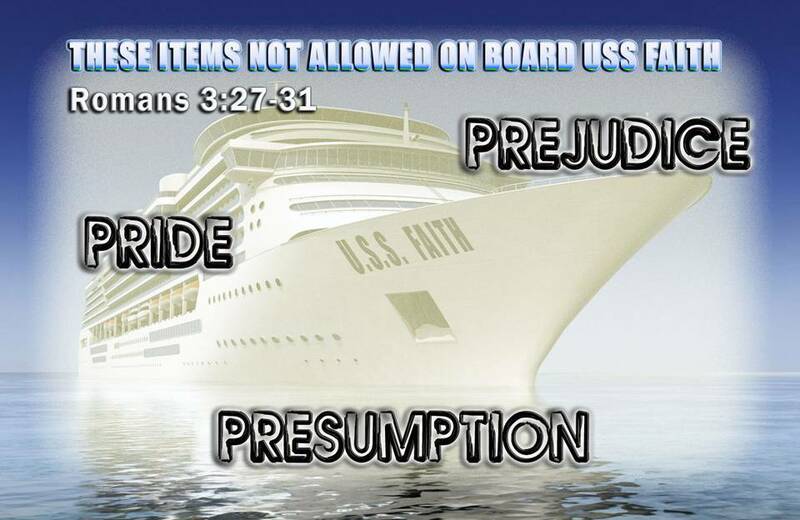 In order to cruise with jesus, there are three things that are not allowed aboard His ship of Faith! 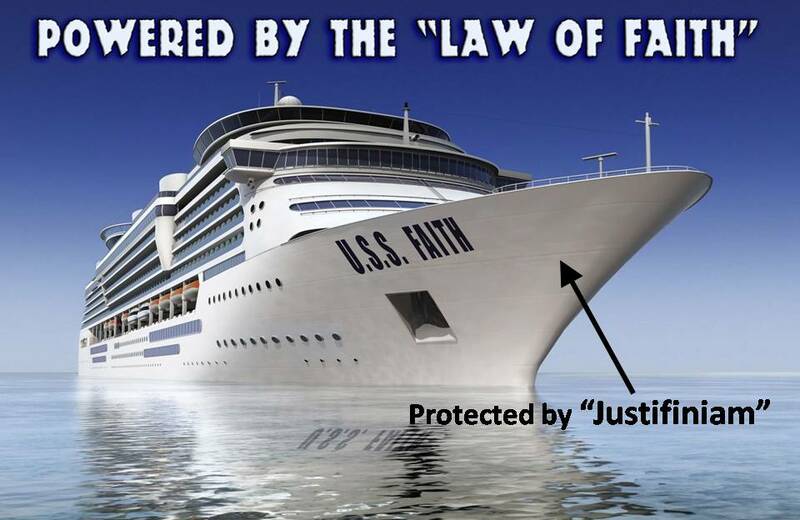 These Three things will keep you from the Power of the Law of Faith which powers the USS FAITH! Paul takes them to the basis of the Jewish creed, the very thing that every Synagogue service always begins with even today…The Shema, “Hear, O Israel: The LORD our God, the LORD is one!” “One” – Not one kind of God for the Gentiles & One kind for the Jews…The Lord is One! The way to God is the same way for all! Does this mean the nd of the law? No! – It strengthens it! The Law is the expression of God’s Character and should never be ignored. Up to this time man tried to be a good man, tired to keep the commandments, tried to serve God, because he was afraid of God, & terrified of the punishment that would come. But now we strive for goodness because we love God, not because we are afraid of him! 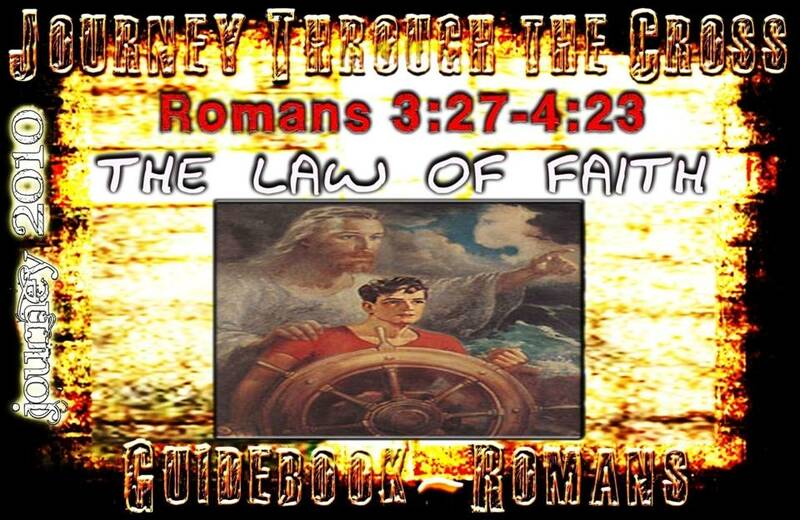 Romans 4 is all about the “Law of Faith” mentioned by Paul in Romans 3:27: “Then what becomes of our boasting? It is excluded. By what kind of law? By a law of works? 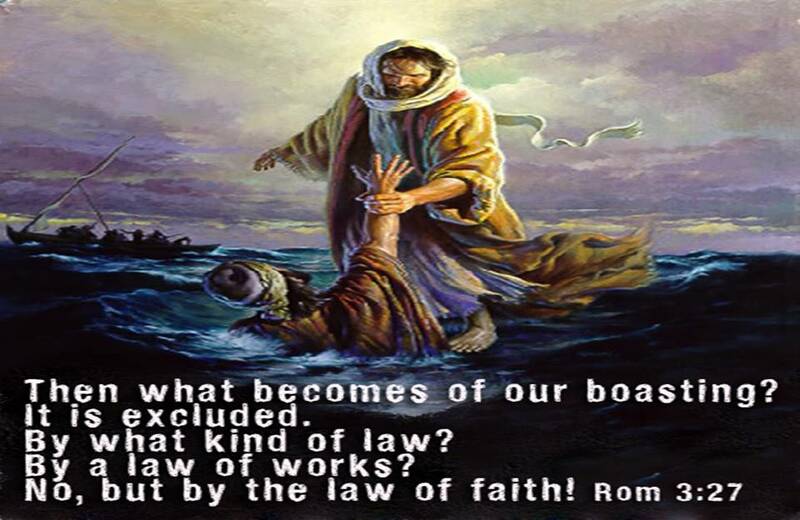 No, but by the law of faith! Here Paul masterfully lay’s out what the Reformers called “Sola Fide”! (Faith Alone). We MUST get aboard the USS FAITH, there is no other way! The Monstrous Hull of the USS Faith is made out of an impenetrable material called JUSTIFINIAM! Let’s go over justification one more time! It is a process by which an individual is brought into an unmerited, right relationship w/God. It does mark that instantaneous point of entry that makes a person right with God. 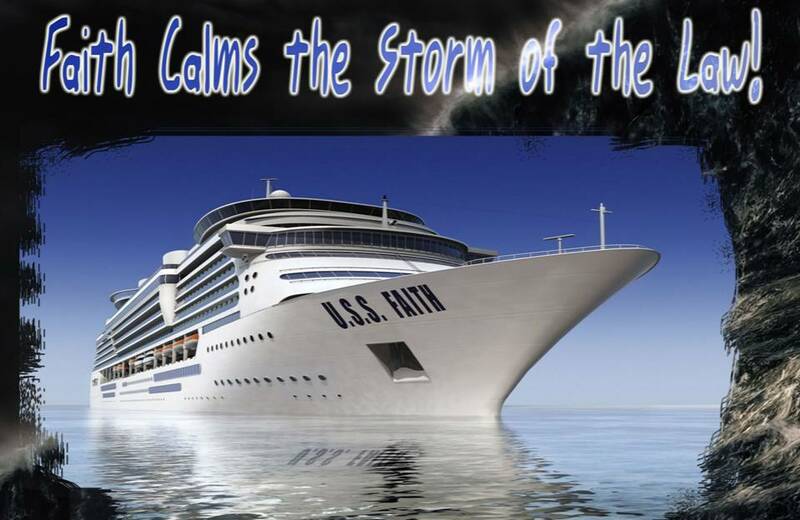 As long as you remain in the ship of Faith, you are declared righteous! Even though the salt spray of sin covers you, the Blood of Jesus continually cleanses you! HOW? 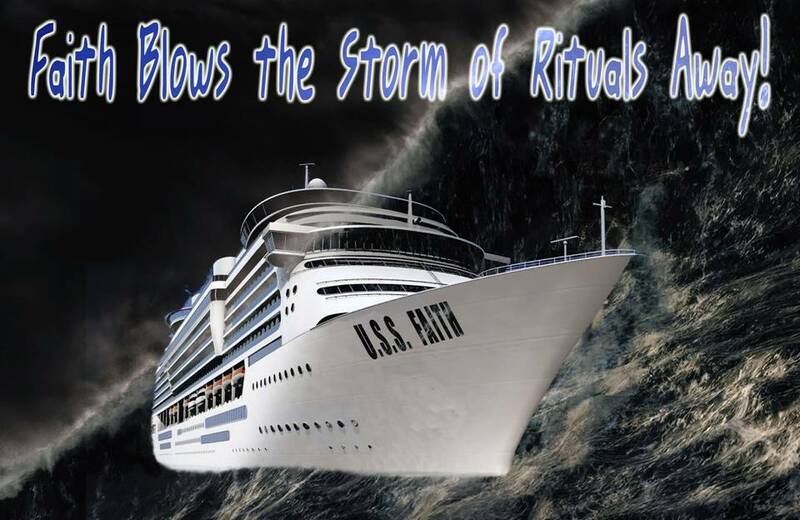 By staying on the ship called FAITH! 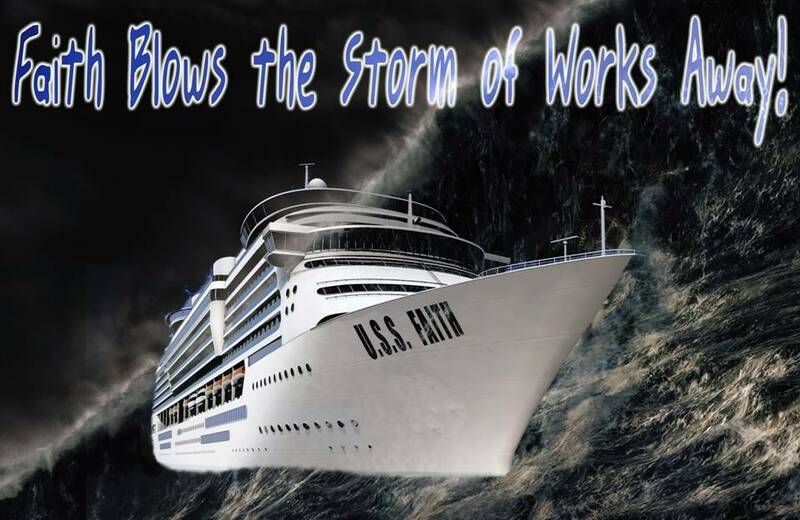 As soon as you get off, as soon as you start to listen to the accusations of Satan, as soon as you start to feel sorry about yourself, as soon as you focus on yourself, you are wavering on the deck, and the danger is that you will fall and become shipwreck. Faith is able to turn the tables on the storms of life. Faith is able to quiet the winds, calm the sea, and deliver you safely to God’s destination. Faith alone! Abraham was not righteous because of his works. 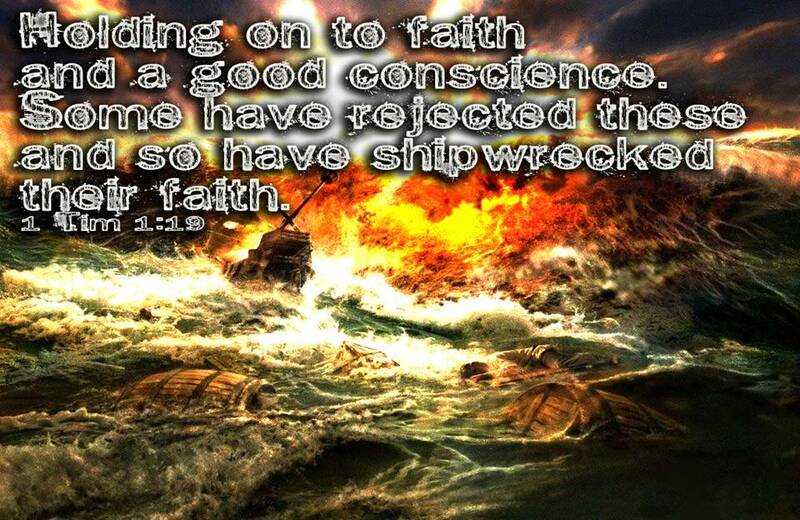 There is no boasting aboard the USS FAITH! “For what does the Scripture say? 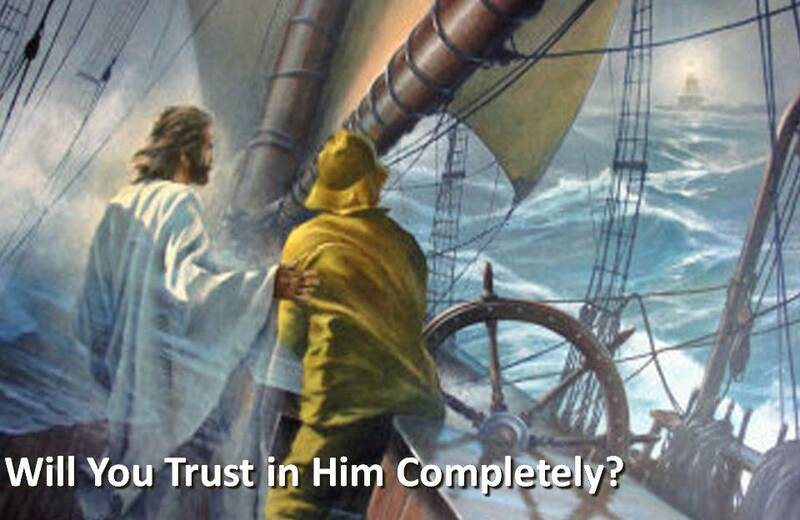 “Abraham believed God, and it was counted to him as righteousness.” He believed God – He trusted in what God said! He believed God would keep His word! (vs 4) “Now to the one who works, his wages are not counted as a gift but as his due.” No, he didn’t work for his right standing with God, nor try to earn it as his rightful wage. (vs 5) “And to the one who does not work but believes in him who justifies the ungodly, his faith is counted as righteousness” God justifies the ungodly not the righteous, simply because you believe His Word! The ‘self-righteous” don’t see their need for a Savior. Only those who see their ungodliness cry out for God! Justification is a double accounting. God will never count our sins against us. God credits our account w/righteousness, as a free gift, by faith, altogether apart from our works. 1 John 1:5-10 (ESV) This is the message we have heard from him and proclaim to you, that God is light, and in him is no darkness at all. If we say we have fellowship with him while we walk in darkness, we lie and do not practice the truth. But if we walk in the light, as he is in the light, we have fellowship with one another, and the blood of Jesus his Son cleanses us from all sin. If we say we have no sin, we deceive ourselves, and the truth is not in us. If we confess our sins, he is faithful and just to forgive us our sins and to cleanse us from all unrighteousness. If we say we have not sinned, we make him a liar, and his word is not in us. 1 John 2:1-6 (ESV) My little children, I am writing these things to you so that you may not sin. But if anyone does sin, we have an advocate with the Father, Jesus Christ the righteous. He is the propitiation for our sins, and not for ours only but also for the sins of the whole world. And by this we know that we have come to know him, if we keep his commandments. Whoever says “I know him” but does not keep his commandments is a liar, and the truth is not in him, but whoever keeps his word, in him truly the love of God is perfected. By this we may know that we are in him: whoever says he abides in him ought to walk in the same way in which he walked. Romans 4:9-12 (ESV) Is this blessing then only for the circumcised, or also for the uncircumcised? We say that faith was counted to Abraham as righteousness. How then was it counted to him? Was it before or after he had been circumcised? It was not after, but before he was circumcised. He received the sign of circumcision as a seal of the righteousness that he had by faith while he was still uncircumcised. 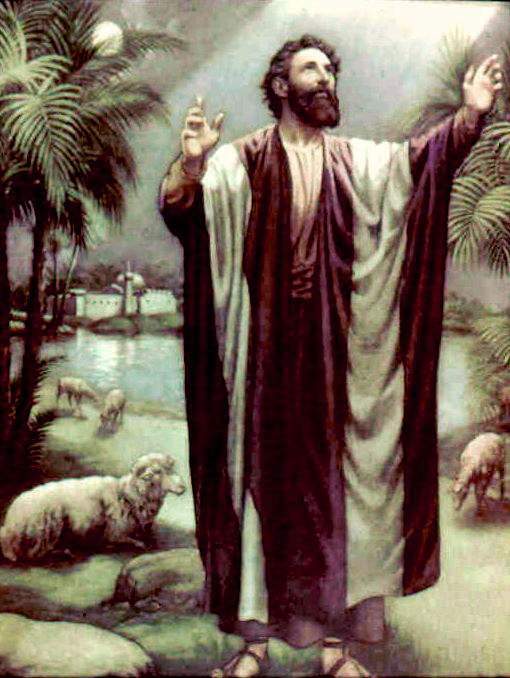 The purpose was to make him the father of all who believe without being circumcised, so that righteousness would be counted to them as well, and to make him the father of the circumcised who are not merely circumcised but who also walk in the footsteps of the faith that our father Abraham had before he was circumcised. So what was the importance of circumcision then? It was not the work that attained him a right relationship w/God. It was a sign of the justifying faith he already had. It was a sign of faith, not a substitute for it. Just like what baptism is to us today! So, The USS FAITH was built before the seal of circumcision. God’s promises to Abraham & his descendants were not tied to their keeping the Law. The promise was of grace. It all starts with faith. And it always has. And it always will! To put the relationship between God & man on a legalistic basis invites the wrath of God! (13-17)for the promise to abraham and his offspring that he would be heir of the world did not come through the law but through the righteousness of faith. For if it is the adherents of the law who are to be the heirs, faith is null and the promise is void. For the law brings wrath, but where there is no law there is no transgression. That is why it depends on faith, in order that the promise may rest on grace and be guaranteed to all his offspring—not only to the adherent of the law but also to the one who shares the faith of abraham, who is the father of us all, as it is written, “I have made you the father of many nations”—in the presence of the god in whom he believed, who gives life to the dead and calls into existence the things that do not exist. That is why it depends on faith, in order that the promise may rest on grace and be guaranteed to all his offspring—not only to the adherent of the law but also to the one who shares the faith of Abraham. Some people are made uncomfortable by walking by faith. They would rather see a system of rules and laws to live by. It is easier to walk by sight that way. It is easier to live in the flesh. “You’re worried about permissiveness–about the way the preaching of grace seems to say it’s okay to do all kinds of terrible things as long as you just walk in afterward and take the free gift of God’s forgiveness. …While you and I may be worried about seeming to give permission, Jesus apparently wasn’t. He wasn’t afraid of giving the prodigal son a kiss instead of a lecture, a party instead of probation; and he proved that by bringing in the elder brother at the end of the story and having him raise pretty much the same objections you do. He’s angry about the party. He complains that his father is lowering standards and ignoring virtue–that music, dancing, and a fattened calf are, in effect, just so many permissions to break the law. Common sense will tell you that you are too wrong to meet the standards of a holy God. Pardoning grace tells you that it’s all right in spite of so much in you that is wrong. Realistic common sense tells you that you are too weak, too harassed, too human to change for the better. Pardoning grace promises that you can trust God to have a better tomorrow. (vs 18) “In hope he believed against hope, that he should become the father of many nations, as he had been told, “So shall your offspring be.”) Contrary to hope in hope he believed! This is chiseled faith – not rose-colored glasses faith; not positive outlook that denies pain & struggle faith. We’re talking about “white-knuckle” faith. The kind that holds on for dear life! This one called “exalted father”(Abram)…was childless, in a culture in which it was a disgrace to the whole family. At 75 called to leave home, given the promise of an heir of his own(“surely now the child will come”) – He didn’t. 10 years past he’s 85, he receives a re-promise. Confident God would do it, but still unclear how, he takes Hagar as his surrogate solution! At age 86 Ishmael is born(but this wasn’t the child of God’s covenant). 13 more years & he’s 99 now. He hears from God again. Name change “father of a multitude”[ok, that helps!] Promise reconfirmed. Finally at age 100 Isaac was born. 25 YEARS AFTER GOD PROMISED! “Hope prevents us from clinging to what we have, and frees us to move away from the safe place, and enter unknown and fearful territory.” Henri J. Nouwen in The Wounded Healer. Christianity Today, Vol. 40, no. 13. He glorified God by letting Him be God! 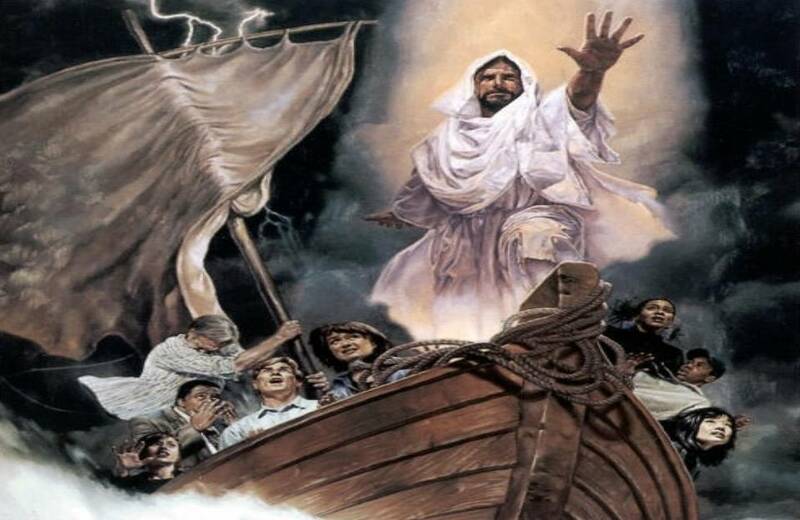 Let Jesus Steer the USS Faith! He is the only one who can take the helm! True Faith would never put its own name in lights, but instead it always tips a searchlight to point up to God & His Grace! (vs 21) “fully convinced that God was able to do what he had promised. Paul says this has application to you this morning so, listen up! This wasn’t just for Abraham. This is for YOU! Only Jesus can wipe your slate clean! Only he can give you His own righteousness! So how is a person saved today?Simply by believing God’s promises as Abraham did. Imputed/credited/accounted – “At Calvary, our sins were put on Christ’s account; when you trusted Christ, God put Christ’s righteousness on your account” (2 Cor.5:21) Jesus Christ, crucified & raised to life, is God the Father’s gracious provision for the sins of a fallen race. Once in a church in Chittagong, Bangladesh, where the Jesus Film was being shown, Weeping and gasps of unbelief could be heard in the shocked hush as Jesus was crucified. As the Bengalis watched, they were feeling the agony of Jesus’ pain and the disappointment of the disciples. In that emotional moment, one young boy in the crowded church suddenly cried out, “Do not be afraid. He gets up again! I saw it before.” A small boy’s encouraging cry gave new hope to the viewers of the film. – “He is risen!” is the cry that gives new hope to all!